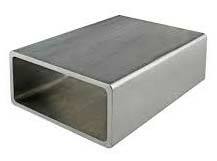 The Aluminium Rectangular Tubes, we offer, are extensively used in industrial sector. Aluminium Rectangular Tubes are in high demand, owing to their long life, excellent performance and dimensional accuracy. Clients can obtain Aluminium Rectangular Tubes from us within an agreed timeframe at rock bottom prices. Besides, the Aluminium Rectangular Tubes are available in all types of alloy & temper and can be supplied as per customized specification.